results will pay off big time. really makes it so impressive. that for the best results. not have to worry about anything in the end. rooms great for people that have breathing difficulties. it has the potential to bring in front some amazing results in the long run. using a steam room as often as you can. right away, so you will be incredibly happy and impressed with the results. steam room does work great for most people and it should be amazing for you too. cardiovascular workout on the body without movement! are surrounded by the infrared heat. sweat in order to cool itself. infrared offers all at a much more comfortable temperature. Infrared saunas are also dry saunas. producing sweat, pumping blood and burning calories. itself, your heart works harder to pump blood at a greater rate to boost circulation. This increase in your metabolism will burn calories. muscle, so they recover faster. reduces soreness on nerve endings and muscle spasms as muscle joints and fibres are heated. heaters will raise your core body temperature, inducing an artificial fever. health and resistance to disease. sweat glands thereby releasing built-up toxins in the body. areas where cellulite is found are the buttocks, thighs, and the abdomen. appearance of cellulite is not always reduced by weight loss. fat cells to reduce the appearance of cellulite. sauna will help you feel relaxed, rejuvenated and renewed. home, open all the time for your convenience. state allowing your body to heal. your skin’s own natural nutrients to the surface. For more than two-thousand years, human civilizations have built steam baths in cities from Rome to Istanbul to provide citizens with the relaxation and health benefits of steam. While most people associate saunas and steam baths with the same conditions and atmospheres, there are in fact slightly different benefits to the two heat therapy systems. In this post, you'll learn some of the most important physical and mental health benefits of steam baths. Both a sauna and a steam bath make your body sweat through immersion in a high-heat environment. However, a sauna achieves this with much higher temperatures and low humidity levels. The average sauna has a temperature anywhere between 176 degrees F and 212 degrees F, with humidity levels around 10%. A steam bath, by contrast, features a temperature range between 104 degrees F and 116 degrees F. The relative humidity inside of a steam bath is around 100%. Due to the higher humidity levels inside of a steam bath, temperatures near those of a sauna would feel far too warm to comfortably enjoy, and could even result in minor scalding of your skin. The dry heat in a sauna makes it safe to spend time in, as well as pleasurable. The greatest physical health benefit you'll enjoy in a steam bath is the easing of respiratory issues. Those who suffer from asthma, bronchitis, persistent coughing, hoarseness, and allergies will find time in a steam bath very relieving. The heat and humidity of a steam bath clears mucus from the lungs, and the humidity in the air (in particular) helps to soothe your airways. In addition, steam baths help detoxify your body by improving circulation. This is particularly helpful for those suffering from liver and circulatory issues. Other benefits include easing the symptoms of arthritis, rheumatism, and other joint pains. A good steam bath will not only loosen up your body and ease physical pain, but can also loosen your mind and relieve mental stress in your life. Those who suffer from intense stress, anxiety disorders and attacks, sleeping disorders, and negative energies are likely to find a great deal of relief from just a few hours each month in a steam bath. Spending time in the warm, humid environment of a steam bath calms your body, soothes your muscles to aid in relaxation, and helps heat up your body to boost your immune system, offering an additional boost that keeps you healthier, longer. Steam baths and saunas both have immense physical and mental health benefits for those who use them on a regular basis. However, the difference in environments might appeal differently to various people. Hopefully this post has helped you realize that steam baths offer their own benefits, and if you prefer the warm kiss of a humid environment, time spent enjoying a nice steam bath can help you heal your body and mind! This entry was posted in saunas and tagged steam baths, benefits of steam bath on August 28, 2015 by admin. Can Regular Sauna Use Help With Weight Loss? One of the many topics explored regarding saunas, and one of the top questions asked relating to saunas, is whether or not saunas can actually help somebody to lose weight. Every person’s physiology is different, and that means that not everyone will react the same way to regular sauna use, however many studies have shown that it can help you lose weight when you use it on a regular basis. The heat from your sauna is bound to make you break a sweat! As you sweat, you burn calories. When you’re burning a good amount of calories from sweating during your daily sauna session, overtime you’ll notice that you can lose weight. Most of the weight you’ll lose from the help of your sauna is extra water weight in your body. When you are losing water weight and increasing the amount that you sweat, you are releasing heavy metals and additional toxins from your body that can interfere with your metabolism. The release of these toxins allows your metabolism to function properly, and can even give your metabolism a good boost! When you have a sauna session and your body temperature increases, your heart works harder to pump your blood. When your blood is being pumped harder, your blood vessels expand and your blood pressure has a tendency to go down. As your heart beats faster it works to burn more calories, increasing the amount of weight you are losing. If you’re, unfortunately, recovering from an injury, using a sauna on a daily basis is a great healing mechanism. The heat from your sauna is known to help repair the wear and tear on your muscles that can come with working out or a lot of physical activity. Saunas are a great tool to assist in speeding up your recovery so that you can get back to your activities and exercises. In the meantime you can take advantage of using your sauna to help you sweat, burn calories, and increase you metabolism. After consulting your doctor and receiving an okay, you can practice minor stretches in your sauna to increase how much you are sweating and give your metabolism the extra boost it needs to increase your weight loss. If you’re not injured and still looking to lose a little extra weight with the help of your sauna then definitely stretch! Stretching is a low-impact form of exercising that can also help to get your heart pumping, your blood pressure decreasing, and the calories burning! Drink water before, during and after your sauna session – staying hydrated helps to release those toxins! Fill your life with healthy habits! --- Healthy food, water, and a good sweat session work well together; give your body some good nutrition to help release extra toxins and metals. Use your sauna daily --- To see the best results you’ll want to use your sauna for fifteen to twenty minutes on a regular basis. If you would like to experience the potential weight-loss benefits of owning your own sauna, check out our selection of saunas here! We even offer free shipping to over 48 states! This entry was posted in saunas and tagged weight loss, weight loss in saunas, saunas on August 21, 2015 by admin. This two-person infrared sauna can make a great addition to your home. 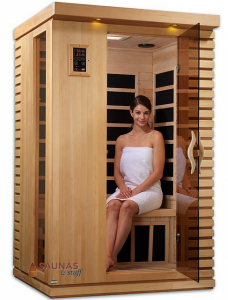 An Ultra Low EMF Carbon Fiber Sauna allows you to experience heat that warms you from you from the inside out. This sauna is perfect for the person who wants to have relaxation just steps away. Owning your own sauna is a great way to stay healthy and relaxed all year long, and this two-person unit is perfect for just about any sized house. Even if you don’t have a lot of room to spare, this model is easily installed in the corner of a room, or small bedroom. This sauna features six PURETECH carbon fiber far infrared heaters with adjustable temperature gauge. Carbon fiber is composed of thin carbon plates that distribute heat evenly. With carbon fiber heaters, more infrared is emitted more efficiently. They also do not require glues or plastics, which eliminates fumes from those materials. Ultra Low EMF provides a heating device that’s designed in such a way to eliminate almost all of the EMF emissions, making the heater very safe to use, even on a regular basis. This sauna’s dimensions are 48 inches x 42 inches x 76.5 inches and it weighs 400 pounds. It is built using tongue and groove construction with non-toxic glue on the interior and a non-toxic finish on the exterior. The sauna also includes a radio so you can listen to your favorite relaxing music while in your personal sauna! You can add a move-able backrest for more move-ability and comfort, or a battery-powered air ionizer to ensure your infrared sauna stays pure and fresh! Saunas & Stuff offers free shipping in 48 states and your product will arrive in three separate boxes. This particular product can be assembled in under an hour! We even have easy assembly instructions on our website! The purchase includes a seven-year warranty on all heaters, cabinet, and electrical components, and a one-year warranty on the stereo. Increase in blood flow – This process helps with detoxification and distribution of nutrients. Saunas make you sweat – This is a natural mechanism the body uses to flush out waste and toxins. As your temperature rises while sitting in a sauna your immune system is stimulated which helps prevent disease. You are able to rejuvenate and smooth your skin without all of the expensive products. A sauna can make exercising easier and more effective by relaxing your muscles and releasing tension after an intense workout. Purchasing a sauna can be a great investment providing many at-home benefits. An at-home sauna offers privacy, instead of a public sauna at the gym, you can have a steam in the comfort of your own home. It provides a greater level of hygiene, you know when you last cleaned your sauna but do you know when the last time your gym cleaned theirs? You can enjoy all the health benefits of a nice steam at your own home without scheduling a trip to the gym. A sauna also adds value to your home, it’s an attention grabbing feature that buyers love, should you choose to sell your home. If you would like more information on this sauna, or any of the saunas available on our website, please feel free to contact us! This entry was posted in saunas on August 7, 2015 by admin. Your sauna session is meant to be a relaxing and enjoyable time away from the crazy and busy world in which we live. 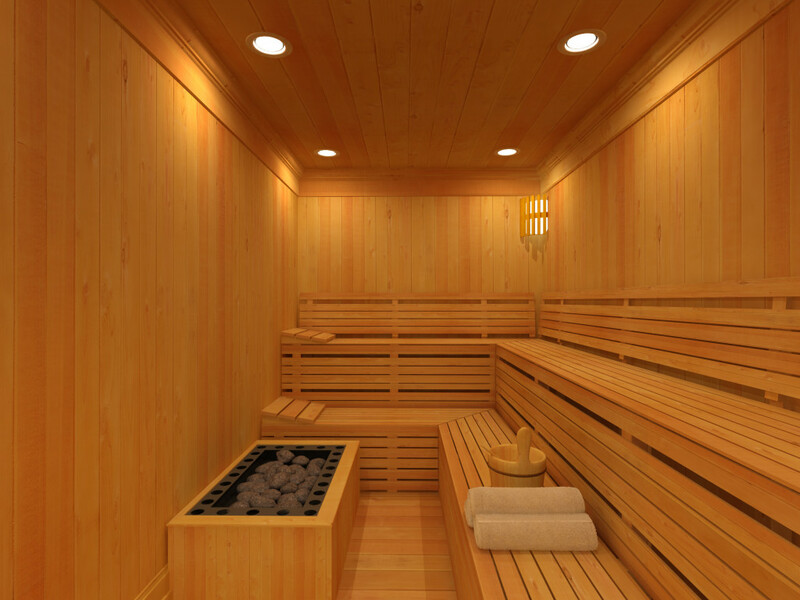 While using the sauna, it’s not recommended that you use electronics, do any strenuous physical activity, or use anything that could be damaged by the heat or steam, so what you’re left with is a good 20 to 25 minutes all to yourself. Use this time to relax, unwind and de-stress. De-stressing is very important for your mind and your body, so we’ve got a few recommendations to help you relax and unwind a little bit more and make the most of your sauna sessions. Something that may really help you take advantage of the time to relax, is adding music to your sauna session. Listening to music can have several benefits for your health, specifically, classical music. This music slows down the heart rate, lowers your blood pressure, and even decreases the stress hormone levels in your body. The heat from your sauna can also help lower your blood pressure and as music works to relax your mind, your sauna will work to relax your muscles to give you an overall calming and enjoyable experience in your sauna. With or without music, meditation is another form of relaxation that you can use during your sauna session. The requirement of being “unplugged” during your sauna session creates the perfect atmosphere for meditation and not only that, meditation can be enhanced by the intense heat of a sauna. After you’ve settled into a comfortable, upright position in the sauna, focus on the hot air moving through your body, loosening your muscles and allowing you to release extra stress. Try to clear your mind of outside thoughts, and focus on being in the moment. You can also visualize negative energy and toxins being released from your body. By focusing on any of these things, your relaxation from meditation will work with the heat of the sauna to help both your mind and body relax. Similar to meditation, deep breathing allows you to release extra stress from your mind and body during your sauna session. To effectively master this technique might take some practice, but start by sitting silently and focusing solely on your breathing patterns. It is recommended to breathe in and out of your mouth at a slow pace, taking in each breath and feeling the hot air. This heat will work to relax your muscles, as the inhalation and exhalation process will also work to release stress. If you allow yourself to think about your breathing patterns, your mind is less likely to be distracted by lingering thoughts from stressors in your life. Try and take each moment in your sauna to relax and let yourself be free from stress and anxiety that may be present in your life. These methods and the heat from your sauna will work well together to help you get the most relaxation out of every sauna session. This entry was posted in saunas on July 31, 2015 by admin. Why Owning Your Own Sauna Is The BEST Thing Ever! Any moment of relaxation is a break from reality and the intense, always-busy world that we live in. Saunas are known to help people relax, and with many healthy benefits, using them daily can be good for both your mind and body. However, getting your daily sauna session in is not always easy, especially when you’re driving to your local gym to find a sauna. Today, not every gym has a sauna, so for some people it may be difficult to find a place that even has a sauna available to use. These are all reasons why having your own sauna is great and may be a good choice for you and your family! Just steps outside your own home you could step into a warm relaxation zone where, after a peaceful 15 or 20 minutes, you’ll leave feeling renewed and refreshed. Your sauna is a place where you can gather with friends, family, or just take some time for yourself to relax. Owning your own sauna means you get to choose the exact sauna that works best for you and your needs. With saunas seating up to six people, you’ll have plenty of room to sit and zone out during your sauna session. You can choose accessories or add-ons for your sauna such as these sauna scents. These allow you to enhance your sauna experience, making it your own and right for you. You’ll never have to worry about what to wear during your sauna session, because it’s just you and the relaxing heat. That means you can wear these convenient and comfortable sauna and spa wraps to give yourself the relaxing and at-home feeling only your own sauna can provide. Although saunas are known to be very sterile areas, having your own sauna allows you to know who’s been in it and how often you feel it should be cleaned. You can use it at your own convenience, as it will always be just steps outside your door or just down the hall. Saunas are very beneficial for your muscles and joints after an intense workout or even a long day in the office. The heat allows your muscles to loosen up and relax. No need to stop at the gym or try and squeeze it in, in the morning. With your sauna at home, you can step inside whenever it is convenient for you. The choices are truly unlimited when it comes to owning your own home sauna. From colors, to types of wood, to size, to accessories, you have the ability to really make it your own. By the time you add in the price of gas, and a membership so that you can use the sauna, it will be more time and money spent than if you have your own. You can easily grab some snacks, beverages and even the rest of the family, and enjoy a sauna session and time together. Making your sauna yours and right for you and your family is only going to increase your relaxation and enjoyment of your sauna. Whether it’s indoors, outdoors, for two people or for four people, relaxation in your very own sauna really is the BEST thing ever! This entry was posted in saunas and tagged sauna, home sauna on July 24, 2015 by admin. Using a sauna is a great way to relax at the end of the day, or after a long workout, and to keep yourself feeling healthy and refreshed, but if you’ve never used a sauna before, there are some key things you should know before using one for the first time. Below are some tips for first time sauna users! Making sure that you’re using your sauna safely is essential! It’s very important that you take the time to read the instructions for your sauna and become familiar with all the features and their uses. If you are using a sauna at the gym or in a public place, don’t be afraid to ask questions if you aren’t sure how to use it. Keep in mind that young children and animals should never be inside the sauna while it is in use, or unsupervised. High temperatures can create health risks for young kids and the heat can be harmful to animals, not to mention, loose fur and debris can mess up a sauna’s processing unit. The length of your sauna session should be a safety consideration as well. The recommended sauna session averages between 15 and 20 minutes. Feel free to take breaks during your time in the sauna to prevent your body temperature from rising too high. The maximum legal temperature for saunas in both the United States and Canada is 194 degrees Fahrenheit or 90 degrees Celsius. However, if the temperature of your sauna feels too hot, you can always turn it down, open the door or take some time away from sitting inside the sauna. A bathing suit and a towel are the most commonly worn items during sauna sessions. A towel is good to have with you as you might want to sit on it, instead of the bench itself, or use it to wipe the sweat from your face. It is recommended to go into a sauna barefoot, however if you feel more comfortable wearing footwear, it is suggested that you wear clean flip-flops. It is best to try and not bring in the dirt from shoes to a clean sauna where some individuals are barefoot. Avoid wearing any jewelry or unnecessary accessories in the sauna. Metal heats quickly and jewelry may cause irritation or even burning if worn in a sauna. Hydration is key! In many ways, water is so important for our bodies. A person can lose up to one pint of water during a normal sauna session, and if not properly hydrated, this can lead to dehydration. Alcoholic beverages should be avoided before entering the sauna and during your session. Drinking only water or hydrating fluids before, during, and after your time in the sauna will help keep you hydrated and feeling good. Cooling down after your sauna session is very important. Take a damp washcloth or towel and press it on your skin to help regulate your body temperature. This will help you gradually adjust your body’s temperature. Entering a cold pool, shower or air can shock your body. Avoid the effects of shock from abrupt temperature change by slowly cooling down the temperature of your body. Besides, what’s the rush? Take your time to enjoy your sauna session, and that means taking time to cool down, too! If you are a first time sauna user, or are looking to purchase your first home sauna, feel free to contact our experts with any questions you may have! All about Steam Baths: What is It, How Does It Work, and What are the Benefits? When most people think about relaxing in a warm environment in their home, a bathtub full of hot water or a steamy shower are the first things that come to mind. For those fortunate enough to have a home sauna, relaxing in the heat of that environment adds a great deal of joy to life. If you haven't heard of a steam bath, you are missing out on the joy of an alternative way to enjoy maximum relaxation. But what is a steam bath? How does it work? And most importantly, what are the benefits of using one regularly? Take a Steam: What is a Steam Bath? A steam bath provides warm, moist heat that sinks into your body. The embracing warmth of the moist air penetrates your skin to provide joint and muscle relief and relaxation. There are a number of names that a steam bath can take, including but not limited to, a steam shower, hot springs, sweat lodge, a wet sauna, or hydrotherapy. Steam baths have existed for centuries. Roman and Greek societies popularized steam baths during ancient times, but Turkish, Russian, and Native American cultures also relied heavily upon steam baths for relaxation and improved health. Although many people confuse a steam bath with a sauna, there are subtle differences that count in the end. Both create warm conditions that make you sweat, but the atmosphere is much different. The average traditional sauna has a temperature between 176 F and 212 F, while a steam bath has temperatures between 104 F and 116 F. However, the humidity in a sauna is extremely low at around 10%, while the relative humidity in a steam bath is 100%. The result is an environment inside a steam bath that feels much cooler compared to a sauna as a warm mist fills the air and penetrates your skin. Conversely, a sauna is only tolerable because of its low humidity and intense heat. The science behind a steam bath is simple. In a steam bath, the room is constantly filled with steam generated by moisture hitting the heating coils and being dispersed throughout the room along with warm air. Your skin responds to these moist conditions by opening the pores, cleaning several layers deep into your skin to remove toxins. Those toxins seep out of your open pores with ease and enter the air in the room. Relaxation and relief are rushed to your muscles and joints at the same time as your open pores allow more oxygen into the body, and the blood flow increases. The rush brings nutrients to more areas of your body, and does so quickly. Steam Up: What are the Benefits? First and foremost, just like other heat therapies, a steam bath can help reduce stress and aid in recovery from muscle and joint pain. If you've suffered a recent injury through normal activity or sports, a steam bath can speed up recovery through increased blood flow and circulation. The improved circulation offered by a steam bath can also help boost cardiovascular health overall. Minor benefits include better skin complexion. Now that you're aware of the ins and outs of a steam bath, it might be time to contemplate installing a steam bath in your own home. There are numerous residential steam generators available for purchase to help you realize the potential for a steam bath in your own home. This entry was posted in saunas on May 11, 2015 by admin. The benefits of having your own in-home sauna are well known by many. With a sauna in your home, you can relax in a heated environment any time you like. You'll enjoy the stress relief that comes with time spent in a sauna, and also reap the health benefits from your sauna. If you've recently considered buying a sauna, you might have come across product options that include pre-cut and pre-built sauna kits. For those unfamiliar with these two types of saunas, this post explores the differences between them and identifies the proper uses (and benefits of) sauna kits. Also known as pre-fabricated saunas, a pre-built sauna kit is a modular sauna that is ideal for use both indoors and outdoors. With your purchase, you receive pre-built sections of your new sauna in your shipment. The components that you receive in the kit are all ready to be put together using included hardware. Pre-built sauna kits make it easy for you to install a sturdy, freestanding sauna quickly. The average pre-built sauna can be put together in one day, depending upon your DIY skills. For those with handyman skills, it could take as little as two to three hours to complete. Common sizes range from 4' x 4' up to larger 8' x 12' models. If you're looking for flexibility when purchasing a new sauna, pre-built saunas are a great option because you can disassemble and reassemble them whenever needed, meaning you can take it with you if you sell your home or even relocate it in your backyard if you redo the landscaping on your property. An alternative option for an indoor sauna is a pre-cut sauna kit. While a pre-built model can be installed indoors or out, a pre-cut sauna kit is designed for indoor use only because it is used to convert or finish off a room, closet, shed, or entire small room into a sauna. 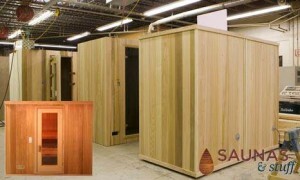 Pre-cut sauna kits offer custom-cut boards that you install on the existing walls to create an insulated environment. Additional insulation is provided in your kit to accommodate your sauna and ensure that the heat and potential moisture is contained properly. Before purchasing a new pre-cut sauna kit, you'll need to accurately measure the walls within the room you plan to convert. Pre-cut saunas are, generally speaking, less expensive than pre-built models. However, it can take longer (depending upon your DIY skills) to put together a pre-cut sauna kit because you are starting from scratch with construction. As mentioned, pre-cut sauna kits are used to finish an existing space. Or you can build an addition expressly for this purpose. When selecting a room, or building a structure in your home to install a pre-cut kit, try to select a space with a low ceiling. The smaller your space is, the easier it will be to heat, resulting in a less-significant impact on your utility bills. Browse our selection of pre-built and pre-cut saunas and find the one that’s right for you! Feel free to contact us if you have any questions about installation. 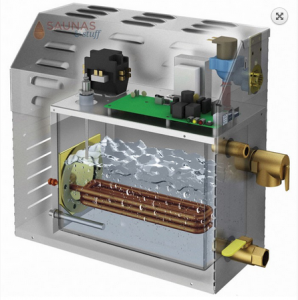 This entry was posted in saunas and tagged sauna kits, saunas on April 27, 2015 by admin.